Good writing is a mixture of the calculated and the instinctual. No one writes through pure dazed inspiration; questions of craft and calculation enter in quite quickly. Last week, speaking at the Bath festival, Hanif Kureishi cast some doubt on the existence of transferable, teachable craft in writing by witheringly classifying 99.9% of his students as “untalented” and saying that writing a story is “a difficult thing to do and it’s a great skill to have. Can you teach that? I don’t think you can.” (Kureishi teaches creative writing at Kingston University, apparently ineffectually).What lies, or ought to lie, beneath the growth of creative writing as a subject is the conviction that a good deal of the best writing derives from conscious craft, if not all of it. Commentators sometimes say that writing can’t be taught; that beginning writers either have “it”, in which case they don’t need to be taught, or they don’t have “it”, in which case money and time is being wasted by the exercise. But writers can perfectly well have native ability, a feel for language, an inventiveness and a keen eye towards the world and still not quite understand how they can do something well, not once, but repeatedly. A good creative writing course will explore underlying principles of good writing – not to impose invented “rules” on writing, but to introduce ways of thinking about writing that are strong and purposeful. You could teach yourself how to make a chair by taking a lot apart, and experimenting with joists. A furniture-making course might school you in some unsuspected skills, and save you some time. 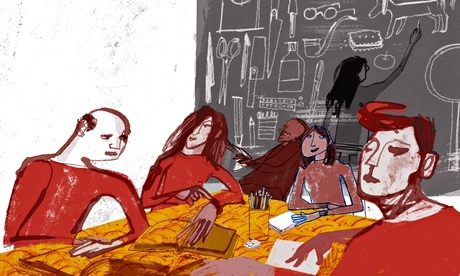 via So you want to be a writer … | Books | The Guardian.